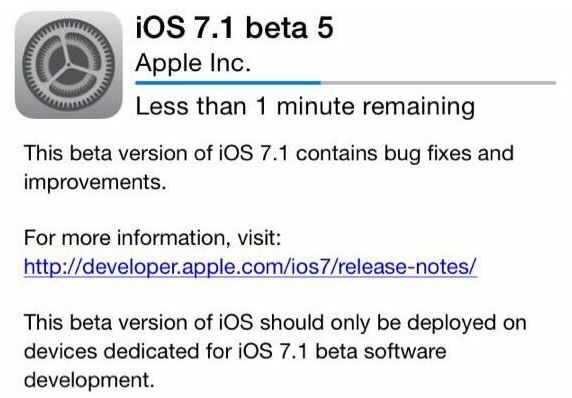 Apple on Tuesday released iOS 7.1 beta 5 to registered developers for testing. The release comes just two weeks after the fourth beta, which contained a couple of minor improvements and tweaks. The new iOS version has a build number 11D5145e and contains some notable enhancements. The guys from Cupertino added several natural-sounding Siri voices for such languages as English (United Kingdom), English (Australia), Japanese and Chinese (Mandarin – China). Apart from that, they slightly redesigned Caps Lock and Shift keys, renamed the wallpaper adjustment mode and called it ‘Perspective Zoom’ and changed the ‘Buy Album’ button in iTunes Radio. iOS 7.1 beta 5 can be downloaded either OTA, or via Apple’s developer center. Before updating your system, make sure you backed up your device and don’t forget this is still a beta, so it may contain some bugs.